Those of you who know me (or have been following for a while) know that my love of pop culture is no secret. I heart tv and movies. So where better to draw inspiration for our big day? 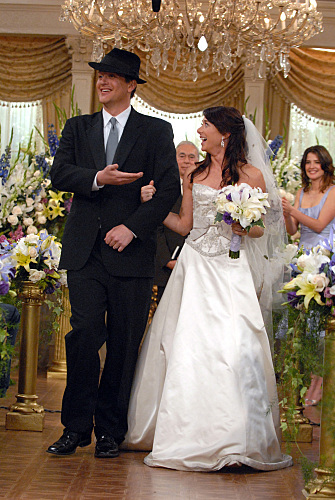 Here are Lily and Marshall from How I Met Your Mother. Their wedding was simple, somewhat intimate, and very much them. I hope that Boy and I can pull off a similar mood :). Many more pictures on their wedding website, lol. Also, ahem... chandelier (and boom mic?). Just sayin. My favorite movie is "The Princess Bride," and I make absolutely no apologies for that fact. Buttercup's wedding day look is a common inspiration for brides who want to go the princess route. I'm not a fan of the tiara, but I love the soft look of her curls. While I know that Ross's wedding to Emily ended up being quite the dramatic affair, I have never forgotten the absolutely beautiful set work for this episode. The Christmas lights and candles set a perfect romantic scene for Ross's proclamation of love... for Rachel. I, a 24 year old young woman, watch a soap opera. I share House's affinity for General Hospital, and have since I was in middle school (LL2 Forever!!). Since I have been watching for so many years, I have seen more than my fair share of GH weddings, many of them between the same people. Fashion icon Kate Howard's wedding to mobster Sonny Corinthos never happened (Kate was, of course, shot at the altar), but you can't deny that her dress is to die for. Doctors Robin Scorpio and Patrick Drake may have married (for the second time) just before a biotoxin was released in the hospital they both work at, but the shine of their simple wedding has lasted through the crisis and Robin's tragic battle with post-partum depression. I'm not a fan of edged veils, but this sweet number looks adorable on Kimberly (the actress who plays Robin). The use of red for this just-after-Christmas wedding was perfect. There are of course many, many more lovely movie and tv weddings. Which are your favorites?